Yesterday saw the Cincinnati Reds take down the Texas Rangers behind the 5th homer of the spring by Phillip Ervin, winning 5-2. Today they stay in Goodyear to take on the Cleveland Indians – though the Reds will serve as the visiting team. The game will start at 4:05pm ET. Also scheduled to pitch today for the Cincinnati Reds: Zach Duke, Matt Bowman, Jesus Reyes, and Ian Krol. The game will be live on the Reds on Radio network. In Cincinnati the game will be on 700 WLW. You can watch the game on Fox Sports Ohio. The game will also be available live on MLB.tv. Castillo vs. Kluber should be interesting. Next round of cuts should be coming after this game or tomorrow. Yep. I’ll give him a mulligan so far, but it’s time for some consistently strong outings. Good to see curt c taking reps.
Have any other teams done this 4-outfielder alignment? Radio feed is talking about it, although they didn’t show it on the TV side. I saw someone else in this alignment. I think it was the Dodgers. It does look like a softball game. One thing hasn’t changed about Puig. He still has no clue about hitting the cutoff man. Could you image Puig AND Ervin in the outfield at the same time. That was odd. Senzel peeled off, and the ball fell right at Puig’s feet. I wonder who called it? Senzel’s inexperience and Puig’s stubborn defensive play made for an inexcusable triple. Good work by Castillo in working out of trouble, but that needs to be a lesson learned and heeded by both Senzel and Puig. If Senzel is going t play CF, he has to be the OF in charge. If a corner OF doesn’t yield, then Senzel makes the play or Puig causes a collision. Hopefully a lesson learned. Yea, I certainly wouldn’t want to learn the hard way. As Indyman says. A lifetime of vertigo. I still say, Senzel to short, Winker, Puig, and Kemp in the outfield. Puig with another bomb, a two-run shot. And there is Peraza, saying not so fast there, Vegastypo. Hits a solo shot. It would definitely be the worst defense in baseball with that alignment, and not by a little bit. Puig, Senzel, and Kemp or WInker all playing out of position. Missed Puig’s Grand Slam, but caught that one! March 17th and I’m tired of THOM!!! What took you so long ???? !!!! Even when Thom is not saying something absurd, condescending, superfluous, self-deprecating or self-promoting, his delivery comes across as weak. Can’t be easy, even in March. So I guess Scooter batting leadoff is going to happen? What am I missing? I’m wondering if today’s lineup/batting order just may be the opening day lineup. We’ve seen Votto-Kemp-Suarez-Puig at two through five enough times that it can’t be a coincidence. I wouldn’t mind seeing Casali become the starting catcher, also. A strict catching platoon would be effective and probably help both players stay fresh and maximize effectiveness. Not sure what was going on with Barnhart; but his receiving and overall defense fell off in addition to his offense. Perhaps the best approach would be to start them out at 50/50 and tilt a little toward the current hot hand as the season progresses. David Bell said before the game that Scooter at leadoff was just to get him the most plate appearances as possible. …. He didn’t rule out Scooter at leadoff, but he didn’t let on that he was leaning in that direction, either. … But I like Tom’s thinking with 2-5 spots. Going to be really interesting to see how playing time in the outfield works out once the season gets started. I get the sense that neither Puig nor Kemp will be happy unless they are playing every day. Early in the game, Chris referenced trade rumors involving Cleveland’s interest in Kemp. Has anyone seen any valid reference regarding such a rumor? I don’t recall any at all, other than pure speculation by uninformed sources. Indians just signed Carlos Gonzalez to a minor-league deal. They have vocally played the “have to reduce payroll” card all winter. Doubtful Kemp is taken on unless the Reds pull the Brandon Phillips Special….eating virtually all of his salary. Good point. I think I saw that CarGo’s deal is a minor league deal at about $2 million. I’m sure ownership would hate to eat $15+ million for Kemp to play somewhere else. Had a fantasy draft tonite on Yahoo….couldn’t find Senzel or Tatis on San Diego. I was thinking it must be because they’ve been sent down? Senzel isn’t on the 40 man roster at this point, if that makes a difference in the fantasy draft. To be clear, as far as I know Senzel’s status hasn’t changed. He has yet to be put on the 40 man and is in camp as an “invite”. This is yet another factor which could figure in where he starts the season along with the service time issue when it comes time to set the opening day rosters. It is likely to be easier to get a run of the mill player thru waivers to open a 40 man spot a week or 2 after the opening day cut downs than during them. 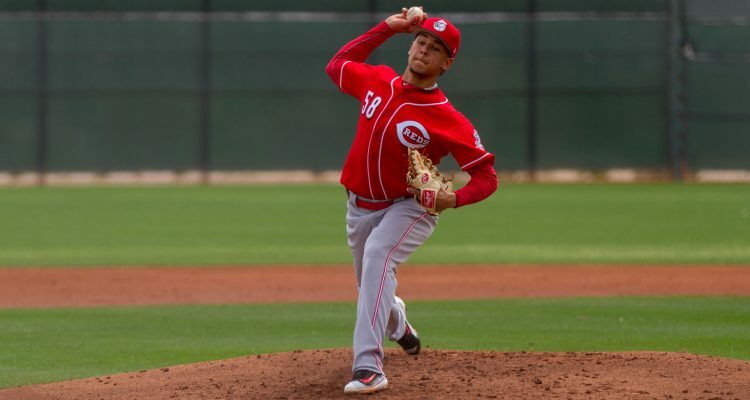 As the Reds look toward setting their roster, notables who do not have an option include pitchers Robert Stephenson, Matt Wisler and possibly Amir Garrett and Brandon Finnegan (option status is not always a transparent matter because of special situations in the rules which grant an additional option or can nullify an apparent option. Among the clubs, option status is known; but, to my knowledge there is no publicly available official list of option status). Any player without an option must be exposed to MLB waivers prior to being sent to the minors. The Reds also have a number of players in camp who might make the team that aren’t even on the 40 man roster yet. Among this category are Nick Senzel, Derek Dietrich, Jose Iglesias and Ian Krol. My best current count is that the Reds have 4 open slots on their 40 man roster plus the very real possibility that Alex Blandino could end up on the 60 day injured (previously known as Disabled) List and not count against the 40 man roster. Also keep in mind that Conner Joe as a Rule 5 player is on the 40 man roster but must make the 25 man roster or be offered back to his previous team, the Dodgers. My best understanding of the Rule 5 situation is that even if the Reds and Dodgers were to reach an agreement (trade) with the Reds keep Joe, before the Reds could option him to the minors, he would first have to clear MLB waivers to complete his release from Rule 5 status. So, unlike some previous years there could be lots of action in the next 10 days beyond guys just heading off to the Reds minor league camp. I believe Reds could open season with Kemp, Schebler, Puig and Ervin in OF. Winker’s spring performance has been weak (161/188/387) and Senzel, as noted above, is not even in 40-man roster and for service time reasons. Therefore, both could be sent to Louisville to return in the short term, allowing to expose Kemp and Puig to the trade deadline. Reds have a full 40-man roster (4 players have been optioned off the active roster which must be no more than 25 players next week). Reds have published a list of out of options players: C Curt Casali, LHP Amir Garrett, OF Yasiel Puig, RHP Robert Stephenson and RHP Matt Wisler. You now have to register to access the site, but it used to be open. Yep, My bad, I clicked on the wrong tab and missed the guys already optioned. Spring training for me too! So, the situation becomes even more interesting. The 40-man roster is full. MLBTR has a breakdown by team of all out-of-option players. The Reds players out of options are Stephenson, Wisler, Garrett and Casali. Not disagreeing but this is an example of what I was saying about lack of transparency because how is Finnegan not out of options? He was put on KC’s 40 man roster in September of 2014 and appeared in the World Series. He has appeared in the minors every year since except for 2016. Seemingly this would have required the use of all of his 3 options. Perhaps in 2017 he was on rehab and not optioned? Was he outrighted at some point with an option remaining then subsequently reinstated to the 40 man? This sort of situation is why I think the official roster pages on team sites should list options remaining for all guys on the 40 man. Correct. In 2017 he was never optioned.